First of all…. 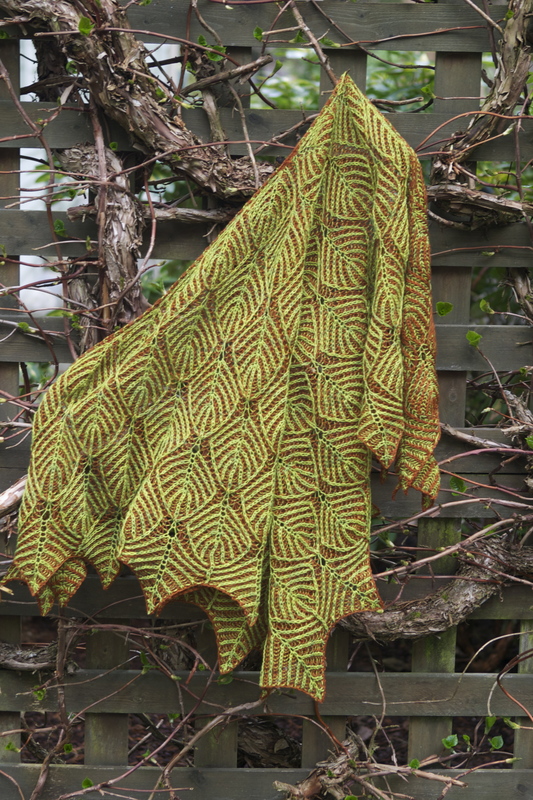 I need to tell you I finished my Brioche 2 color shawl that I posted the yarn for earlier…. and its so nice I’m going to give it a proper size photo. Just like my climbing Hydrangea… its wearing the colors of both Spring and Fall. This is a pattern I fell completely in love with when I first saw it called Under Dutch Skies. I decided that I would need to learn to brioche, just so I could make one of my own. I started it towards the end of the Ravellnic Games with the hopes I might complete it. But as the deadline got closer and closer I started to push myself and made more mistakes… primarily with my leaf spine counts. As you can see here, in rows prior I did my increase in the wrong right side stitch instead of the center stitch. Once you’ve made that mistake well… its not one I was able to tick back and then work up correctly so thank goodness for lifelines, but it still meant frogging several rows. 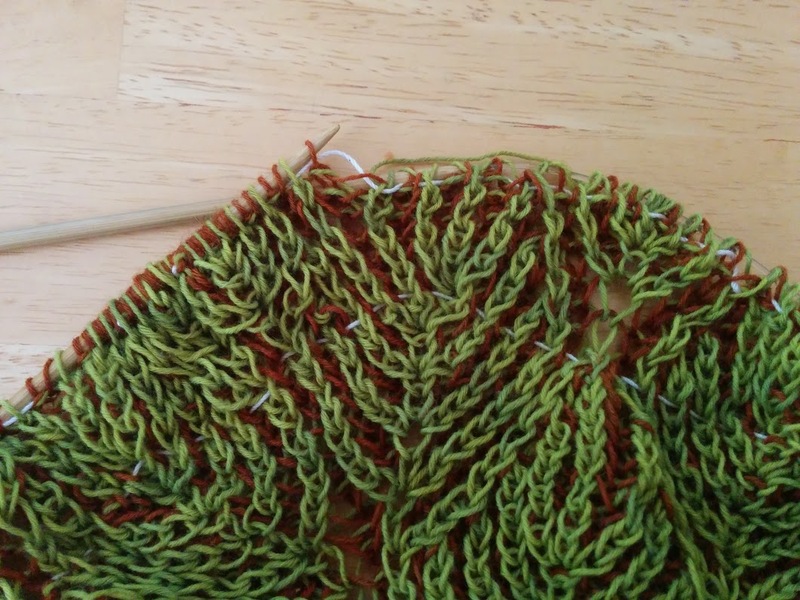 I wasn’t going to make it to seven leaf repeats in time to finish… so it was finally time to take a real break and get the shawl out of my head for awhile. This also freed me to make an additional leaf repeat. I was so excited when I got to the binding off. Got a bit creative with my folding so you can see the front and back colorways. Here’s a full view of the backside. I realized as I was laying it out to block, that I’d made a mistake earlier on, and I’d just never found it. Now here’s the thing about knitting mistakes. They are kind of like looking at yourself. When you look at yourself and your own knitting you find all the things you wish were better. Maybe we wish we were thinner, or maybe we wish our hair looked better or that there is less of it in some places and more of it in others, and we can get focused in on all the things that aren’t just right. (My stitches are uneven, I twisted that one stitch wrong, etc) But when you take a step back and you look at the whole picture like someone else does…. both you and your knitting are so much better than you think. So I’ve given you hints now go right ahead… find my mistake. Not so obvious until you find it…. Feel free to click on the photo until you get it in a larger size too! Now the reason for that whole exercise is that sometimes when we gift or sell our handcrafted items we feel this compulsion to point out those mistakes. There is no need. Its a gorgeous thing worth of praise WITH its minor imperfections. Now perhaps you have some eagle eye friends and family or over time they find its special unique “feature” and feel compelled to point them out to you. You can respond to this in a few ways, but here’s my favorite two. This is an identification feature. It proves that this item is unique and should it be lost or stolen you could correctly identify yours, even if someone else made the same item with the same yarn. wow, soooo beautiful! well done.